The New York State Society of Professional Engineers is proud to announce that the One World Trade Center project has been selected as the 2014 NYSSPE PEC Project of the Year. The award will be given out at the NYSSPE Annual Installation & Awards Reception & Dinner which will be help Thursday June 5th at 6 pm at the Hyatt Place East End, 451 E. Main St., Riverhead, NY 11901. The One World Trade Center (1WTC) is the tallest of the four buildings planned in the reconstruction master plan for Ground Zero in lower Manhattan. Not only that, but the 1WTC is the tallest building in the Western Hemisphere. The tip of the spire atop the 1WTC reaches an elevation of 541 meters, or 1,776 feet, designed as a tribute to the signing year of our Declaration of Independence. 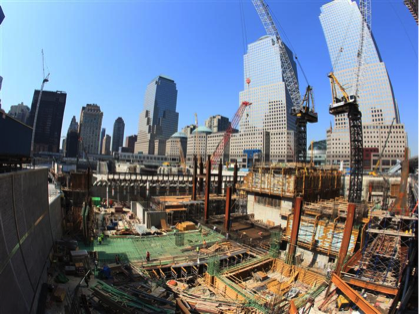 The structure of the 1WTC features a hybrid system that combines a strong concrete core with a perimeter ductile steel moment frame. It consists of 71 levels of office space and eight levels of mechanical, electrical, and plumbing space. In addition, a 50-foot-high lobby, a “sky” restaurant, parking, retail space, and access to public transportation networks have all been included in the design. Scheduled to open in 2015 are two observation decks, located at elevations of 1,362 feet and 1,368 feet, which are the exact heights of the Twin Towers. 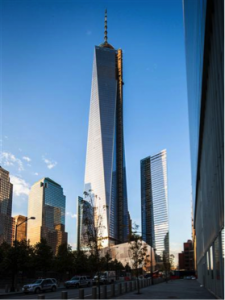 Sustainability was carefully considered while designing the 1WTC. The tower itself was built of recycled construction materials, and a rainwater collection system has been designed to invigorate the plaza’s greenery, cool the building, and replenish the memorial fountain. The 1WTC incorporates safety features for speedy potential evacuations. Extra-wide staircases interconnect at various floors, each with exits leading directly to the street. A dedicated first-responder stairwell is included in case of an emergency. 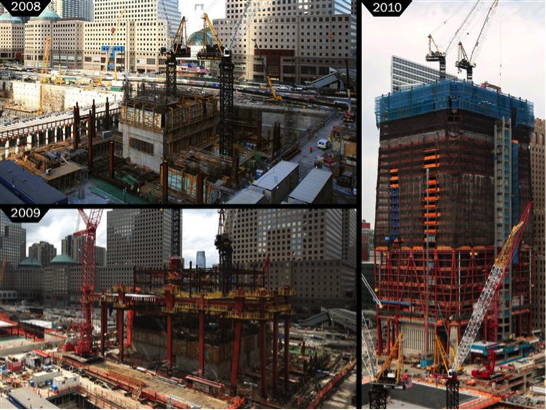 The 1WTC was designed and built with safety and sustainability in mind. It stands today as a shining beacon stretching high into the sky to inspire New Yorkers and remind them of the strength of their city. Contributors to the One World Trade Center Project include the Port Authority of NY & NJ as lead developer; Skidmore, Owings & Merrill LLP as architect; WSP NY as structural engineers; Tishman Construction as general contractor; DCM Erectors as steel fabricators, detailers, and erectors; and Schlaich Bergermann & Partner as consultants. Note: NYSSPE facilitates posting on this blog, but the views and accounts expressed herein are those of the author(s) and not the views or accounts of NYSSPE, its officers, or its directors, whose views and accounts may or may not be similar or identical. NYSSPE, its officers, and its directors do not express any opinion regarding any product or service by virtue of reference to such product or service on this blog.